I have several Glock 19s and this pistol is compatible with the same holsters. I also got a chance to fondle one and the trigger is exquisite. 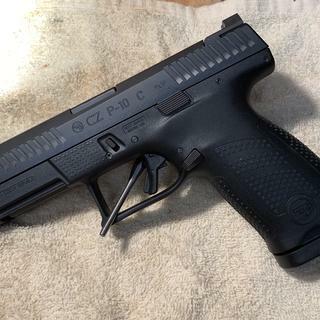 My Instructor raved about the CZ-USA-P-10. I did my own little research and I understood why I needed to have one myself and decided to go ahead and purchase one. Took some of the back strap off with some sandpaper,to look at you would never know! Right up there with my Glocks. Great gun. Full ambi, great stock trigger, capacity, reliability, front rail....all the features you want in a modern striker semi-auto. The best hand gun ! CZ all day every day! Great gun! So glad I purchased it being my first gun!